Do you share Kevin McCloud’s sordid fascination for people trying to build the house of their dreams while simultaneously leaving their common sense in the bank manager’s office while signing the huge loan they inevitably need? I do. It’s been compulsive viewing for the last few years. A voyeuristic fascination with other people’s pain and suffering at the hands of building projects. In the world of reality TV though, Kevin McCloud gets to stand at a distance from the fracas all around. It’s not his money, his reputation, his graft that’s being viewed and dissected. It’s a bit like a newspaper film reviewer standing in front of the cinema screen, critiquing the unfolding plot. No skin in the game, so very easy to pass judgement. 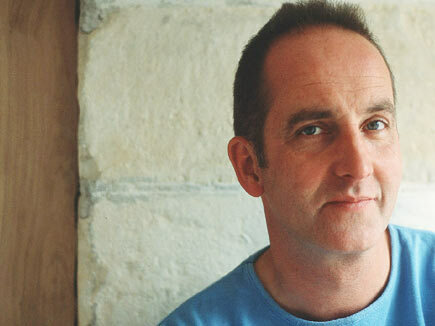 Well, Channel 4 are turning the tables on Kevin McCloud. He’s signed up for Kevin’s Grand Design (a working title) in which the eponymous presenter will build an entire village! The programme will follow him attempting to raise the millions of pounds of investment needed to fund thirty houses. It was all going sweetly until the original investment fell through, putting McCloud back on the road to get some money from the City. Expect fun and games as he jumps though the planning approval process hoops. Filming is expected to continue over the next two years, so there are no details about how soon the four hour-long episodes will be screened. Improving the quality of housing in the UK is Channel 4’s aim – with an emphasis on sustainability and affordability. It’ll be fun to see the pressure on McCloud after all these years. Maybe a follow-up will see how Kirstie Allsopp and Phil Spencer would cope relocating out of London and up to the North of Scotland, and watching Sarah Beeny tarting up a dilapidated tower block in Manchester’s Moss Side. 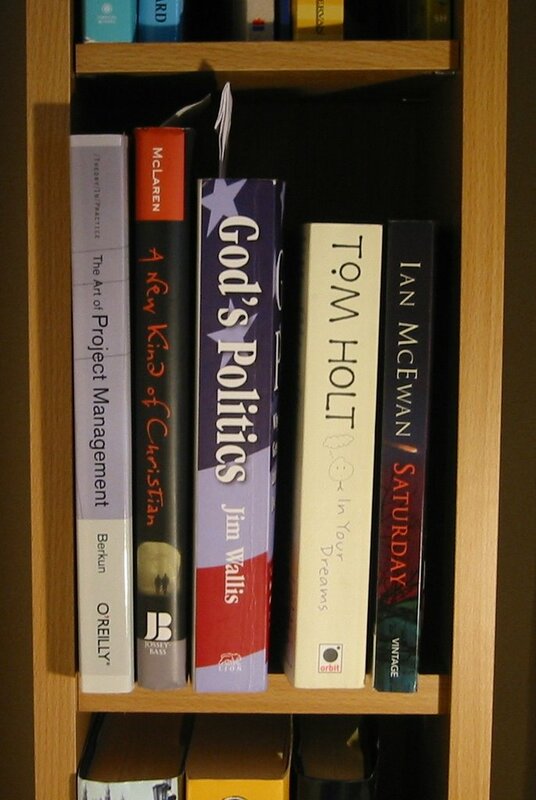 Postponing the effort required to make Alan in Belfast go three column, and in an attempt to coerce myself into reading through some of my backlog of books, I’ve added a new feature to the blog. No need for a drum roll! Mini-reviews of anything worthwhile or notable will be posted. Feel free to add your comments in advance. So I’ve now watched the first three episodes. They’ve been down the shaft, fired off a few rounds, killed an old Apple II, gone back into the open air, then back down again, fixed the Apple II, typed in the sequence. Oh, and some stuff on the raft, the beach and down a pit. 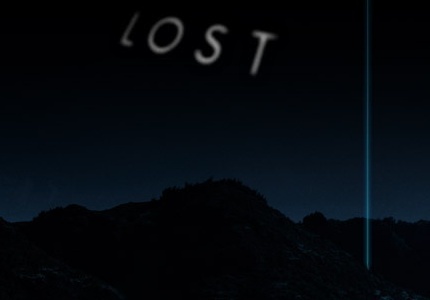 It’s every bit as good as season one. I reminds me of 24 when it was still on BBC2, except 24 had a lot more tension. It was quite gruelling to watch two or three episodes of 24 series 2 back-to-back in an effort to catch up. Looking down the list of saved content, looks like there's still some Green Wing to enjoy. Harris Interactive - Scrooge meets David Brent? you know that you want to read the story, just in case there’s dancing involved. However, the article was not about a paper firm in Slough. Instead it’s Harris Interactive: “the [turn on deep radio advert voice] 13th largest and fastest-growing market research firm in the world …” according to its website. The firm is in the process of consolidating its three Manchester offices, with 10–15 employees losing their jobs as a result. In parallel with this rationalisation, the European president emailed line managers with a revised company policy on office-based leaving parties and email announcements. “office space must not be used during work hours for leaving events, and email is not to be used for mass communication of any leaving social event”. Seems that the timing of the memo ties in with the imminent demand for leaving parties. Great for an already battered staff morale I’m sure. 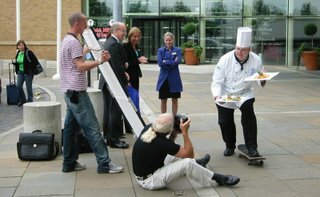 Now, all companies are within their rights to impose their own policies on staff, in line with what they think is best. But whereas disgruntled employees would have previously fumed, muttered and been a bit less productive for a few days, today's world allows them to express their dissatisfaction by contacting the national press. I suspect that Harris Interactive will be in a slightly larger font on the blogosphere's tag cloud by the end of the day. I've added a Technorati chart that should prove (or disprove) the hypothesis. Having watched the film Pavee Lackeen a few months ago, I’d posted about BBC Three Counties Radio show Rokker Radio – a peak time show catering for the underrepresented travelling community. A couple of months on, how is it going? 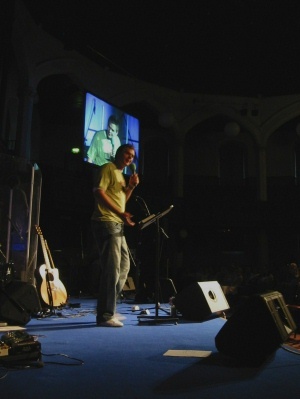 This week’s Ariel magazine includes an article about the journey so far. Turns out that Rokker Radio is going from strength to strength. The producer Karen Shrosbery explains that the presenter Jake Bowers, who once travelled in a traditional Romany caravan, has built a sense of trust with the previously shy community. Many of the themes mentioned in the article echo the issues raised by the Maughan family in Pavee Lackeen. Buy it on DVD now! And now over the summer, the six BBC local radio stations in the east of England are combining together to simulcast the show across the whole region. Jake Bowers points out that the traveller community “is about the same size as the Bangladeshi community, half of one percent of the population”, but whereas Bangladeshis are now taking advantage of BBC training courses, Bowers is only aware of one other BBC employee “with Romani blood”. Good to see a minority community and culture getting a voice and a focus – something that can only add to the richness of society , increasing understanding and decreasing unfounded hate. Contrast this story to the spate of racist attacks across Northern Ireland at the weekend. 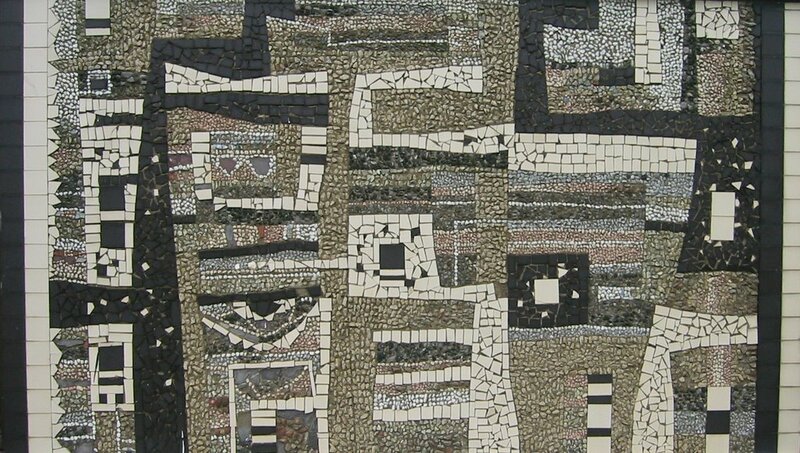 I mentioned an outdoor mosaic when I posted photo-less last week. Colin Middleton was an Irish artist. Heavily influenced by van Gogh, he regarded himself as the only surrealist working in Ireland in the 1930s. During the 1960s, he was head of art at my old school – Friends’ School in Lisburn – but long before I was there! 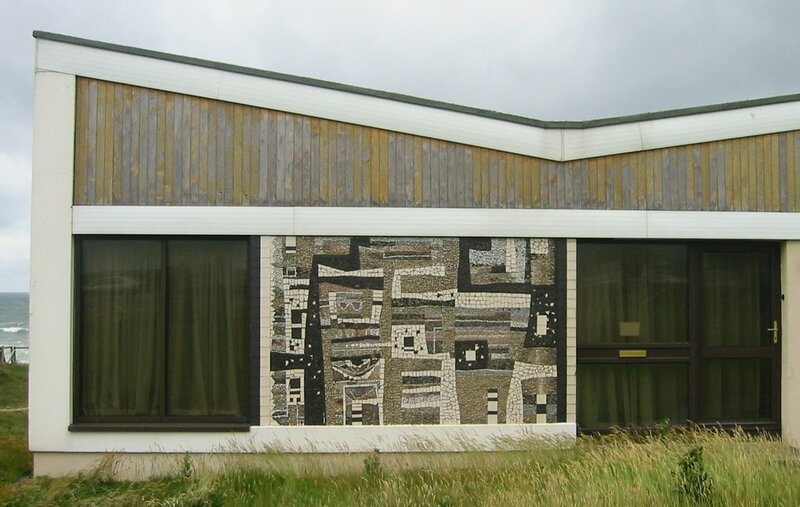 The mosaic was eventually made to Middleton’s design, and still adorns the front wall of the property, which has an unrivalled view across the Portstewart Strand beach, across to Castlerock and beyond. 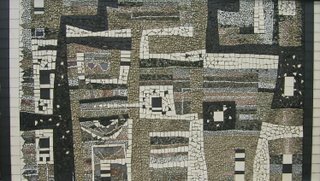 Years later, Middleton’s work became highly valued, and the mosaic caused the house to be listed. While the site could be worth between and half and one million pounds, it would be difficult to ever make the major changes needed to improve the existing structure and expoit the location while satisfying the planning restrictions. 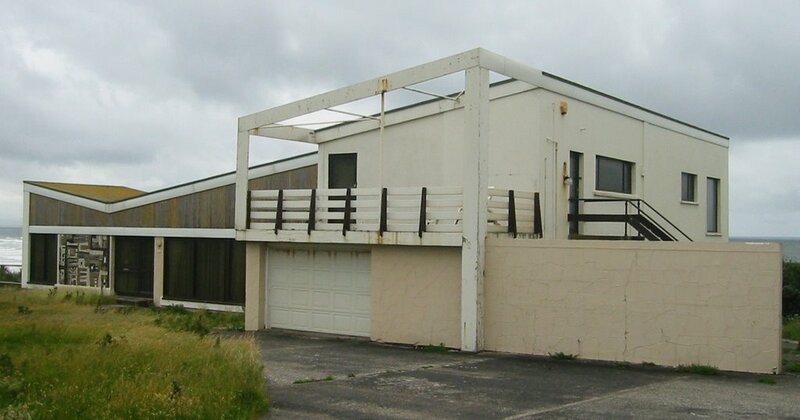 Today the house looks unloved, though not entirely derelict. Bye bye Frappr. Hello BlogMap. Talking of dumping … A couple of bad experiences, and Wayne Ordinary American packed his Blogger bags and headed over to the admirable Wordpress. And I can understand why. Blogger’s image loading is very unreliable at the moment and getting on my goat too. Together with the lack of tags, I do often regret opting for Blogger back in March. How fickle (and unfaithful) we all are in the online world! I’m toying with going three column … it’s the trendy thing to do after all. 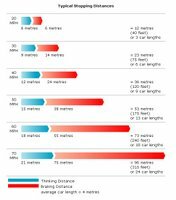 Might put the third column on the far right (rather than the de jour left hand side). I frequently read blogs on the move using a PDA whose display size doesn’t support multiple columns. As a result the columns are displayed in order, putting a lot of little used garbage in the way of the main up-to-date postings I’m trying to read. But it’s a lot of effort to tweak the Rounders template that I picked up from Blogger. Would need a boring flight though to get it all sorted. No more mention of Downpatrick for a while. Jury Service - not over yet! So no more pictures of Downpatrick Cathedral, or whinging about the lack of parking etc. Ok, one last whinge. It’s nearly impossible to buy a cup of takeaway tea in Downpatrick at 10am in the morning. Court with breakfast wouldn’t have been good. JPod - Am I a refugee from a Douglas Coupland novel? I read Douglas Coupland's Microserfs when it first came out years ago, and thanked my lucky stars that the UK IT industry wasn't quite so disturbing. Over the years since, the real world has caught up with his vision. "Microserfs for the age of Google." As my employer and others move from massively distributed teams (no two team members living or working in the same town) to collocated teams (some sitting together onshore in the UK and the rest based in one location offshore in India or China) the world of JPod doesn't seem so far away. My peers and I could easily be described as eccentric ... though not quite so obviously mixed up as the jPodders. JPod is self-referential, and full of typographical and techie jokes. I love the inter-team joking - swapping keyboard letters around. Colleagues near me have played similar games over the years. The six foot inflatable sunflower adorning the desk opposite mine, along with the magnetic letters arranged on the filing cabinets mocking corporate initiatives and catchphrases, are testament to continued office merriment. Like an alternative comedian from the 90s, the book is full of observations which seem familiar - eg, remembering how slowly the in-flight information screens update on long flights, and the pointlessness of knowing that the temperature outside is minus 59 degrees Fahrenheit. There's also the odd page of seemingly random information included - summarising the contents of the main character Ethan's hard drives. JPod begins with the sudden need to bury a dead body, and ends with the need to dig it back up again. Circular. Much like Coupland writing Microserfs and JPod. By the end of the book, the main characters and their close relations are impossibly intertwined, having been through bouts of people smuggling, kidnapping (offshoring a person), random acts of furniture kindness, people management madness, some basement drug harvesting and misuse, not to mention deliberately planning to hide a disruptive element in a soon-to-be-released computer game. A recipe for three hundred pages of chaos. The book makes be wonder if I and my colleagues run the risk of being as amoral as JPod's characters. They inhabit a godless world with little thought for the reasons why they get involved in the unethical (and often thuggish) schemes and situations that confront them. Normal stereotypes presume that white collar (perhaps, geeky T-shirt) professional workers lead fairly respectable lives outside work - with perhaps only one or two vices. Yet JPod paints the picture of Canadian professionals with no moral backbone. Maybe I'm naïve in being surprised? It's a good read if you can stomach the IT jokes and the non-standard style of interrupting the plot with pseudo-random information. I stumbled across an interesting article – not quite sure of my path to it. I suggests that Flickr isn’t the king of photo sharing sites. Instead, Photobucket.com (which I’d only heard about recently) has more than double the market share of its nearest rival Yahoo! Photos. Another interesting facet of this is to look at how MySpace users are hosting their images. Do read the original article for the full details. Anything you'd like to say to the car behind? 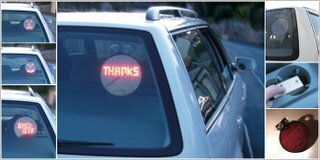 Over the years I've often had the conversation with my Dad that it would be good to be able to send messages to other drivers on the road. 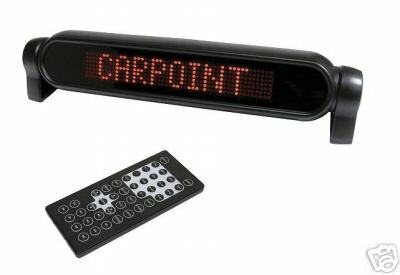 There's only so much you can convey with gesticulation, flashing lights, tooting your horn and driving aggressively. For a more refined and specific messaging capability, the solution has always looked like having to fit a scrolling message bar on the front and back window - not a viable or practical solution. But revolution is only around the corner. An Australian firm have come with a device (pictures at top of post) - they call it the Driv-e-mocion - that can send a variety of predefined messages (ie, it's not user programmable) via a wireless remote to the sign stuck to your rear windscreen. It's not perfect - doesn't seem to cover your bulb's blown, baby on board or maniac - but it's progress. Newly launched Coca-Cola Zero sits behind regular Coke and Diet Coke in third place in the Coca-Cola brand stakes. I stumbled across a bottle while shopping in Secret Sainsburys yesterday. Well the second statement may be a fact, but I’d disagree with the first. Tastes like a cheap cola. Yuck. Fails my taste test. No more rash purchases, I promise. Ice cream. Sitting in a window seat watching the sun set while eating a Morelli’s banoffee pie ice cream. 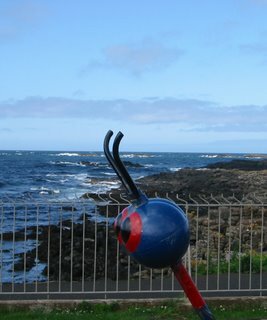 Sea views and walks. As I’ve documented in other posts, the views from Portstewart are spectacular - rain, hail or shin e- no matter what nature decides to show off. 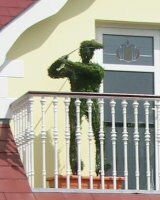 It’s the last of these that’s connected with the photo I took of a balcony overlooking one of the fairways at the Strand course: a topiary golfer up on the balcony, holding what looks like a real wood. Despite the weather – did I mention the gale force winds, lashing rain and huge waves – we really enjoyed our week up on the north coast. Spending time with family and enjoying each others’ company is a lot more important than the weather. And in the end, we got out and about to the beach and play parks as much as we needed. Some snaps from the week below. I've noticed in my posts, as well as those of others in the blogosphere, that there is a temptation to dwell on the negative and be more critical than positive. So in a bid to consciously reverse this trend, I decided to look for the positive in something I don't usually engage with or enjoy. Football in general. The World Cup in particular. You'll notice that I haven't made much mention of the sporting championship currently being played out in Germany. Can't work out whether I dislike it more than Wimbledon, or whether the four year cycle is better than the annual tennis-fest. Jon Snow - bicycle riding, tie wearing, Channel 4 News presenter - commented recently on his Snowmail podcast that more countries (total of 208) are signed up to FIFA (governing body and organisers of the World Cup) than to the United Nations (191 member states). So more countries are willing to have football in common than will share their political opinions for the good of all. That's good. Jon explained his personal reasons for deciding to support the Iranian team - which made me want to look up a wall chart (if had one) to figure out the chances of USA having to play Iran! In fact the only football match I've heard any of was the USA v Italy match - and then only because Jett and Wayne based their LTA chapter 40 podcast around their visit to a Belfast bar to watch the match. I’ve just realised that although I’ve heard that England are through to the next round, I’m not sure if they’ve finished playing all their group matches yet? Ignorance is bliss. 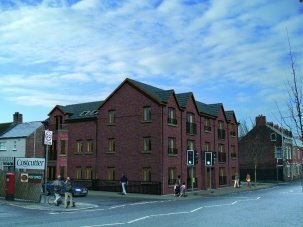 The Ballyhackamore branch of MCW Residential estate agents in East Belfast is releasing some new properties first thing on Monday morning: the first four apartments in the new Elm Court development on the Beersbridge Road. 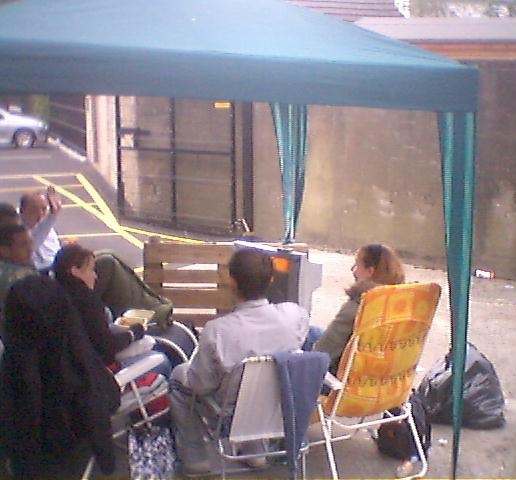 The first couple started the queue on Thursday, pitching their tent at the side of the MCW office. Two lads sitting on deck chairs joined next. Third in the queue joined after getting a phone call to tell them that a queue had started. Some folk further back in the queue look like they've brought enough with them ready to move in and furnish their apartment immediately! A 28" widescreen TV sits under their garden gazebo. No kitchen sink though. So four apartments ... but there are more than four sets of people in the queue? They explained that those who don't get an apartment straight away will be listed to get first refusal on the next ones to be released later this year, without having to queue again. The one bedroom apartments are going for £107,950; two bedrooms will set you back £129,950. So is an apartment worth 96 hours wait in the cold? 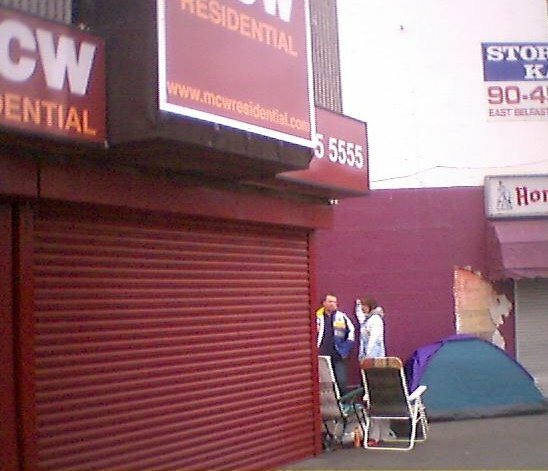 No doubt the queuers will all be the best of friends and tell their tale for years to come. Arriving about 5.30pm, we went upstairs and were seated in the conservatory area - overlooking the sea. Like nearly all the other parties that arrived at Zio last night, we quickly moved out of the draught to an "inland" table! Zio's menu has a good range of starters and main courses - chicken dishes, pizzas, salmon, burgers, pasta dishes, as well as the all-day carvery (which remained unused and hidden under tin foil while we were there). Something for most tastes. We didn't stay for deserts so I can't comment on those. The starters arrived promptly - the olives confirmed as being yummy. The main courses were brought to the table steaming hot, but we did have to chase the side orders of chips. The salmon and penne pasta went down a treat. Now maybe I should put my hands up and admit to eating quite a lot of pizza when I'm out - and the same couple of sorts of pizza. But Zio Portrush's Quattro Stagioni pizza was disappointing. The whole point about a "four seasons" pizza is that the four toppings (pepperoni, ham, peppers, mushrooms in this case) are each placed in a different quarter of the pizza - thus creating four different tastes as you eat your way around. Zio's chef just mixed the ingredients together. It's less effort for the chef to keep them separate, and a whole lot more pleasant to eat too. Not wanting to be boring, but now for the what's-it-like-if-you-bring-young-children comment. The default seating area is upstairs - so don't bring a buggy, wheelchair or zimmer. The waitress brought across a wooden high chair without being asked when we arrived, even giving it a quick clean with a spray. No tray on top, but functional. The baby changing is in the disabled toiliet downstairs where the baby shelf could do with a good wash (I dread to think what was growing at one end), the tiny peddle bin was already overflowing with a couple of nappies, and the hand towel dispenser was empty. Better than nothing, but not ideal. So to conclude, Zio Portrush was a pleasant early evening venue, and the food was good, but not brilliant. Expect it to fill up with holiday makers and caravaners as the peak season arrives (hopefully along with better weather). 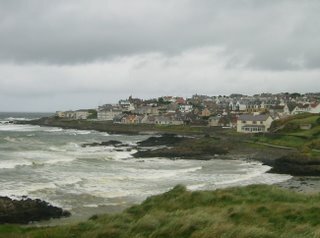 And if you've been to Zio Portrush, please post a comment with your opinions and experiences, good or bad. Turns out that the house next door is listed. 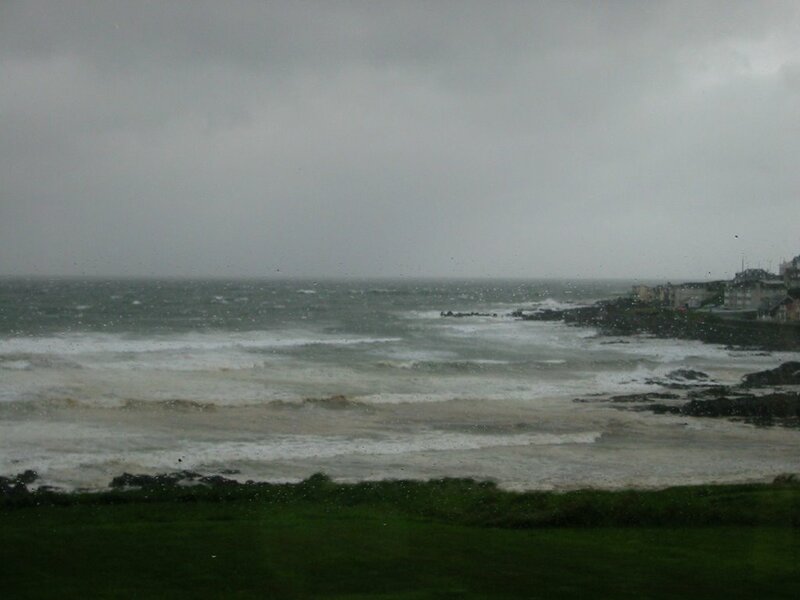 Not because of it's box-on-stilts appendage on the front that partially blocks our view of Portstewart Strand. 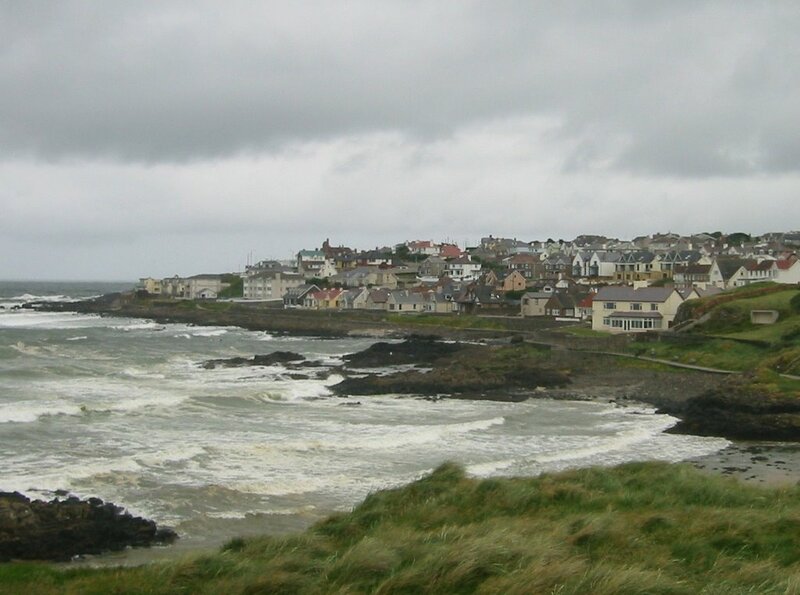 Nor for its once-pristine white walls or vantage point overlooking the sea, beach and Castlerock in the distance. No. Because it has a mosaic on its front wall that was designed by Colin Middleton. I'll post a photo and an explanation when I get back (assuming the weather clears up to allow me to stand outside long enough to take a picture), but there's a special prize (*) for anyone who can post a comment explaining the signifance or merit of a Colin Middleton mosaic on the outside of an otherwise derelict building (without resorting to wikipedia). (*) special = no prize, just the recognition of being right! Howling wind, sand and salty spray in our eyes, blazing sunshine, grey heavy showers, crashing waves, sand shifting across the strand. The upside is that we can now look up at the incoming clouds and predict when the next band of rain will hit, accurate to a couple of minutes. 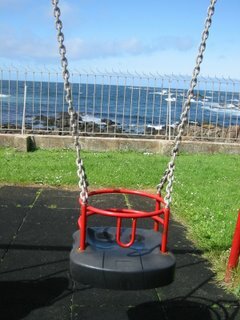 Now certain communities in Northern Ireland and Scotland would have a reputation for strict Sabbath observatance that goes so far as locking children's swings in parks on Sundays. It's not that common, but sometimes gets into the news. This year, Northern Ireland councils have taken it to a new level. 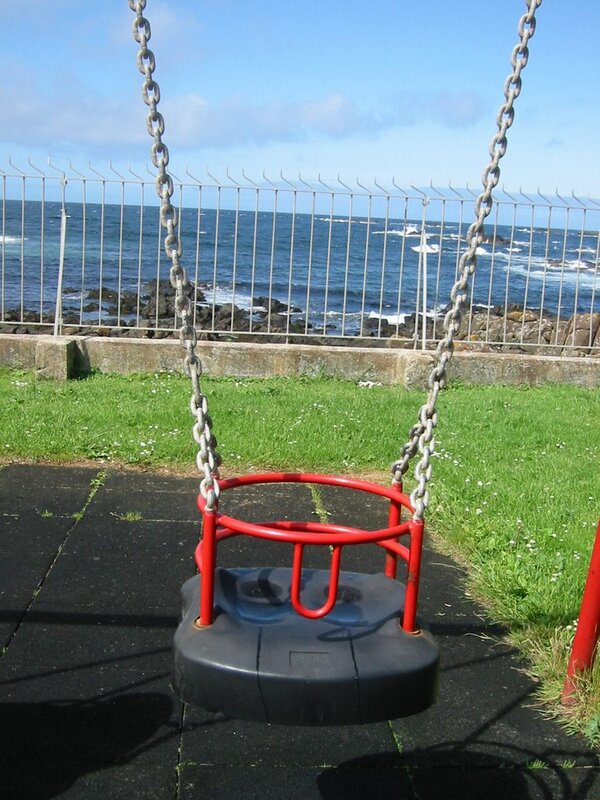 Holywood Council decided that June would be a good month to replace the swings on the common overlooking Belfast Lough. So when the heat wave hit us mid-June and we went down to Holywood for a swing, we were faced with a big metal fence enclosing the site of the old swings. The very next day - in similarly piping hot weather - we tried out the play park at Lady Dixon's. The swings were in action, but most of the other climbing frames had been removed, and metal fences surrounded the new colourful treats that were still being erected. 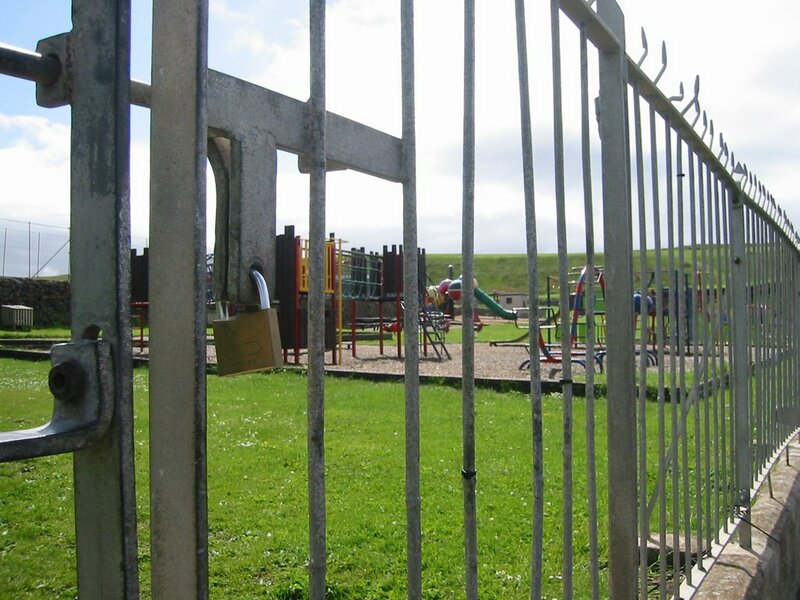 Not that a fence round a pile of building material would stop the average NI parent from making a gap and pushing their kids in through it to play on the half-finished frames and slides. The Council Parks staff could only look on - unable to stop the libertarian revolution. I throught that Portrush was going to complete a hattrick of closed play parks. The Ramore Head park gate was padlocked - though the sign said it was open all day May to September. After starting to ring the council to complain - kind of them to put the phone number on the sign - we noticed another obscure entrance around the other side. A good swing was had by all in the empty park - and the adults enjoyed the slide too! Update: Just back from the beach - left the house in the dry, arrived back soaked to the skin. A few nice sandcastles built, some rearrangement of the streams through the sand, lots of standing watching the tide come in around our feet. Oh and some screaming at the hailstones (late June?) hitting an 18-month old face. Why does the good weather always break when I go off on leave? We've had pretty good weather in Belfast for most of last week. And then on Friday it rained for the majority of the day. 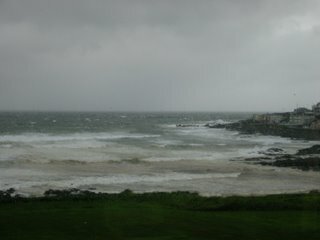 And it has continued to be grey and overcast - with the odd sunny shower - while the forecast isn't good for this week. Hmmm. Is there a Tubby Poop Scoop? I've noticed that Teletubbie land is littered with munching rabbits ... but they're either incredibly well behaved or Noo-Noo pops out at night to clean up. Will there ever be enough time in life to read all the books I'd like to read? The bookshelves in our house are already overflowing - the combination of two bookworms and a baby daughter's collection of fun books! Problem is that some are only half-read, and way too many haven't even been started. Given the pressures of working life, will I ever get time to make a dent on my pile of reading? Or will I continue to be tempted to buy books faster than I can read them? Which reminds me, must finish reading that copy of Jim Wallis' "God's Politics" that William Crawley sent me from his book giveaway on his Will & Testament blog recently. I'd even started to scribble a review on the back of a Air Berlin sick bag! Mind the sheep in the middle of the road! We nearly had an accident on the way up to the north coast on Sunday afternoon. My wife was driving, and half way between Ballymoney and Coleraine she commented on the lovely lambs in the fields to the side of the road. What I saw in the distance was a small animal in the middle of our side of the road ... getting progressively larger. It was a lamb that escaped from a van at the side of the road, and was making a foolish bid for freedom. Running fast into the traffic - the wrong way up the middle of our lane. What I also saw was the fact that our car wasn't slowing down yet. "Mind the sheep in the middle of the road!" I exclaimed. Sharp brake, skid, regained control, and managed to swerve past a lamb that continued to gallop up the road while my wife regained her composure. 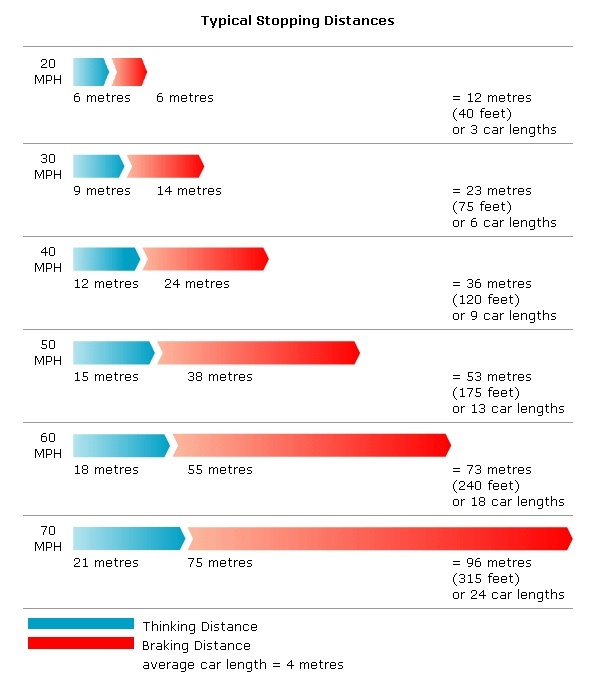 Moral of the story: (1) don't be distracted by the romantic images all around when there is a life and death issue straight in front of you; (2) the stopping distance of a well loaded small car traveling at 60 mph on a wet day is probably the length of an oil tanker. I'm in a positive holiday mood - the weather couldn't get any worse! Is there a dearth of Irish bloggers? 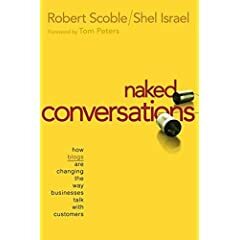 Scoble and Israel’s book – Naked Conversations: how blogs are changing the way businesses talk with customers – was an interesting read. Written last year, and published this year, the book is still quite a fairly contemporary look at the world of blogging, and in particular how it can be harnessed for good and bad by businesses. Encouraging your staff to talk about their company and their work in public. Encouraging your customers and competitors to read about your company’s thinking and products, and to allow them to comment back to you and each other. Chapter 8 looks at blogs and national culture. It ends with a question about national blogging trends. Blogging has taken off in England with the general public, but in Ireland it has not. The English are generally regarded as reserved. On the other hand, through literature and taverns, the Irish are generally regarded as a great story-telling people. So why don’t the Irish blog? More seriously, he explained that that most likely reason for Ireland’s dearth of bloggers is not cultural; it is that Ireland lags behind other countries in broadband adoption in the home, with about 3.4 subscribers for every 100 households. “Now, if the price of broadband were cheap enough that bars would provide free WiFi …” he speculated. But we think it will be awhile before tavern-based WiFi services displace darts as a pastime. In fact we hope so. This success is in sharp contrast to the much slower take-up rates in the Republic of Ireland. Ireland is currently lagging in the bottom quarter of the OECD's league tale of 30 countries. Ireland's penetration rate of 6.7 broadband subscribers per 100 inhabitants compares with an OECD average of 13.6 and an EU average of 11.8. 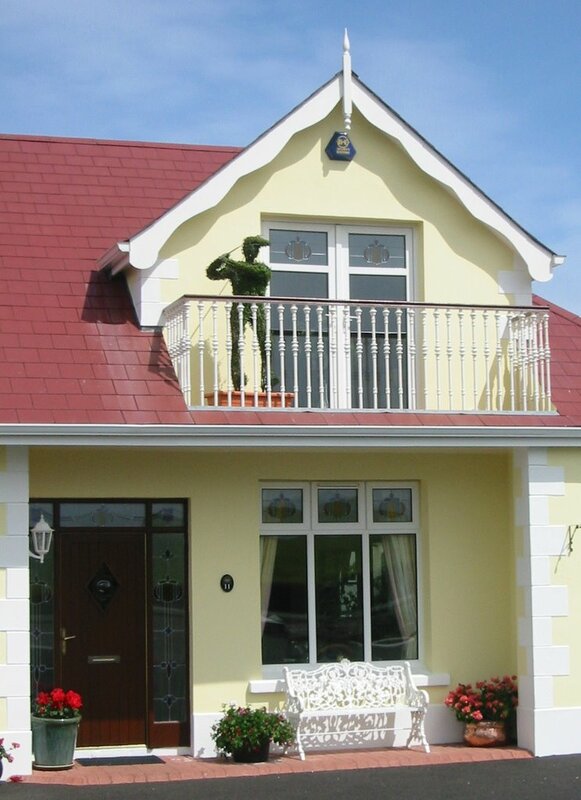 Figures from the Central Statistics Office (CSO) show only 45.1 percent of Irish households had internet connections by the end of 2005, up from 38.2 percent in 2004. So while Irish broadband usage has increased, it's still nowhere near northern levels. The digital divide cuts across our island. Oh, and I don't think public WiFi will make much difference. By the time a pub can afford to install broadband and offer a secure service to customers, then the price will have fallen and the general broadband penetration across households will already be significantly higher. But as a fairly recent entrant to the publishing end of the blogosphere, I'm encouraged by the community of Irish bloggers - north, south, east and west. Doesn't feel like a dearth. Scott Adams has been churning out Dilbert cartoons, day after day, for years. Longer than I've been working. And they continue to sum up working life so accurately. As well as the daily cartoon, you can also read Scott Adams' blog. In the week that Robert Scoble announced on his blog that he was leaving Microsoft to work at a video-blogging start-up, I finished reading Scoble’s book – Naked Conversations: how blogs are changing the way businesses talk with customers – co-authored with Shel Israel. As described in the book, Scoble’s blog has helped to portray Microsoft as less evil and more human, even while his postings haven’t always been 100% supportive of the Microsoft corporate line. But he’s not leaving his job because he’s posted once too often. And in true internet fashion, Scoble’s departure premiered on someone else’s blog before appearing on his own, while the sudden interest in his new employer caused a surge in traffic that has continued to dog their webserver performance all week! Semantic Web - apparently it’s ready to implement ... if we knew what it was! Flicking through some of the recent copies of free IT magazines that are piling up at home, I read in Computer Weekly that the semantic web was ready to implement. Pardon? The what internet? Semantic? Basically, having finally got the internet to the stage that it’s usable by mere mortals without ponytails or degrees in Computer Science, one of the next waves of innovation is to make internet content machine readable. Is this some Doctor Who Cyberman plot? Machines taking over the world? No. Today we spend a lot of time in search engines trying to find what we’re looking for. If the information was tagged in a consistent way, and available in a machine-legible format, computer applications could search for the required information, interpreting and using the results. Imagine software that searched for someone selling a particular book through Amazon or eBay at or below a particular price, and placed the order. A simple mashup I hear you say. Tagging is very Web 2.0. Adding Technorati tags to posts is all the rage - and very useful. But as you’ll know if you have ever tried to tag a film review post, it’s difficult to know which tags to add: movie, movies film, films, review, reviews, cinema? For the semantic web to be usable, common predefined and public dictionaries of tags will have to be widely employed. It’s called an ontology - a data model that represents a domain, used to reason about the objects in that domain and the relations between them. So if Amazon, eBay and thousands of other online retailers adopt the same standard of tagging for their store catalogues, software agents will be able to understand what is being offered. And if the purchasing functions are labelled, that might just make the semantic web vision closer to being realised. And given that Tim Berners-Lee is involved, we’d do well to listen the inventor of the World Wide Web. He has a good track record. 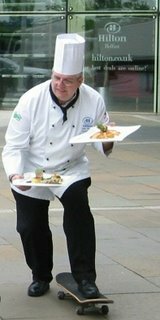 Skating chef makes quick getaway from Hilton? What does the image to the left say? I’ll give you a clue ... it was a publicity shot. But what is it trying to advertise? If you scrolled down, you’ll see the wider picture – but it won’t help. The Belfast Hilton Hotel. A Chef. A skateboard. If you see the image in the local press, please drop me a comment explaining what they were advertising. 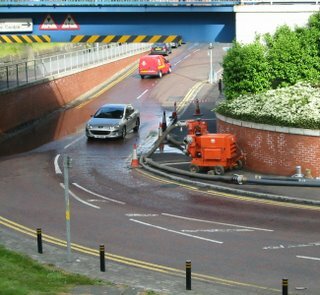 Fingers crossed, the water table in Belfast won’t rise too far too quickly. Having pumped out the Mays Meadow under-bridge flooding, day three was fairly dry. However, this morning – day four – the water was back, the road under the bridge was closed, and local taxi drivers were doing three point turns. Bigger and bigger water pumps were being moved in ... and by 5pm it was all dry again. But how long will it last? Daily Telegraph to launch Mini Telegraph? 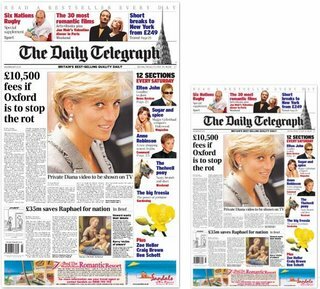 Reports in this morning's Media Guardian add to the wider speculation that the Daily Telegraph may soon publish a tabloid Telegraph light edition alongside its traditional broadsheet edition. 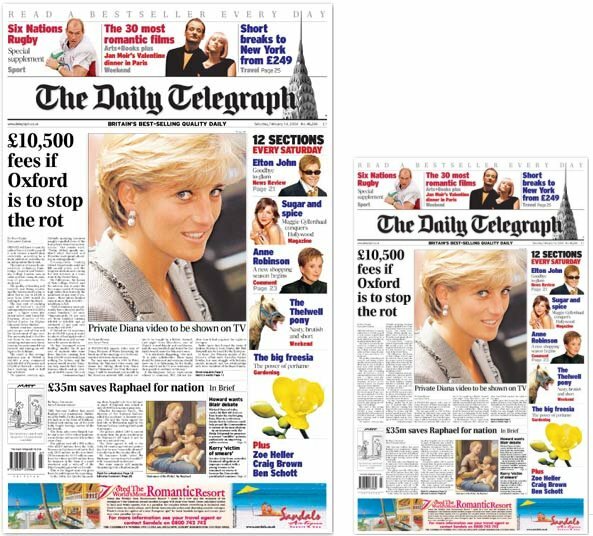 The Financial Times and The Daily Telegraph are the only two UK national papers to have remained in a broadsheet format. With FT readership in decline (down 28% in the UK between April 2005 and March 2006), the Telegraph will be keen to avoid any dent to its dominant position in the quality daily space as the market moves towards favouring smaller papers. Murdoch McLennan, chief executive of the Telegraph Media Group denied the report, saying "The Telegraph definitely has no plans to go tabloid at this time". But if it did go ahead - perhaps as part of the Telegraph's move from it's shiny Canary Wharf to it's even shinier new location near London Victoria Station - what would it look like? Half the size, half the content, half the price. Does it sound crazy to publish two formats of the same paper? The Independent tried it for a while when they first launched their compact edition in London before rolling it out UK-wide. The Times also offered both formats for a limited period - but spent a lot of time pruning and reshaping the stories and pictures to fit the different sizes. And that's on top of publishing the stories on the papers' websites too. So it's not terribly viable in the long term to dual-version an entire newspaper. However, the model of offering a lite version of a quality paper with cut down content is successful in parts of continental Europe - particularly Germany. 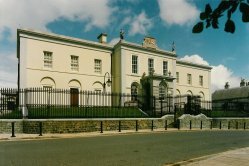 Back and forward to Downpatrick Crown Court another couple of times this week. The jury panel numbers are shrinking - with only about one third of the panel attending on Monday - probably due to holidays. Don't think anyone has asked to be excused to watch the World Cup yet! Though some with long-held tickets for the cricket at Stormont yesterday were excused. Monday's jury selection experience was enhanced by the defence solicitors spilling water all over the ancient wooden table they're sitting at. Unlike the judge and the jury panel who have court stewards and jury keepers to look after us, the clumsy solicitors were left to run out to the toilet to get loo roll to mop up the flood. Yet like a swan gliding down the river, the jury selection went ahead without any hesitation or delay. Don't think the judge even noticed the antics in front of him - he certainly didn't acknowledge them. I've commented on jury selection before, and the procedure of solicitors shouting "Challenge" (defence) or "Standby" (prosecution - the Crown). On Monday, the solicitors didn't even have their lists of jury details open in front of them. Decisions were being made purely on the basis of appearance (clearly including gender) and not on home address or occupation. Several juries were sworn in. One defence solicitor used up all 12 challenges (coincidence that they were nearly all objections to women jurors?) ... causing the judge to remind them half way through that although challenges can be made with no reason, they could feel free to justify with a reason if they so wished. They continued to challenge with no stated reason. Also starting to notice procedural differences between judges. Probably because they don't get to sit and watch each other in action in the court, so a variety of patterns build up. And despite the seriousness of some of the cases, there's a increasing levity amongst the jury panel - playing the lottery to see if their numbers get picked out of the box. Must be most disconcerting to be the defendant sitting in the dock watching the smiles from the jury panel above. So with just over a quarter of the jury panel sitting on the hard benches in the gallery this morning, I should stand a fair chance of being called downstairs for appraisal by the beady eyes of the solicitors. 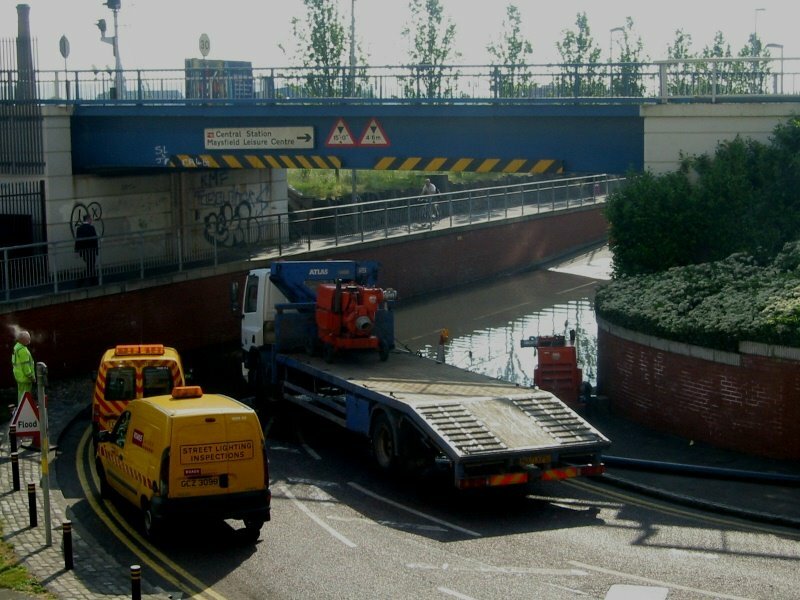 Twenty four hours after the flooding started and the road had finally been closed - by the police rather than Roads Service. A car had got stuck (or its engine flooded) in the deepening puddle and had to be pulled out by a recovery truck. 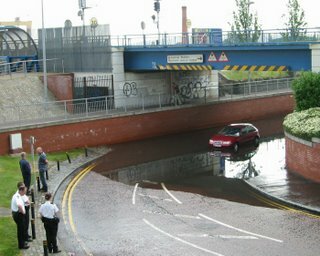 So the police arrived to rescue the driver - I think they shouted encouragement as he got his feet wet. Soon after, a pump arrived. 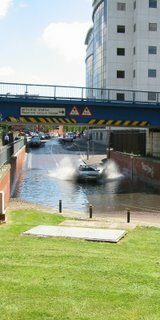 By late afternoon, the surface water was gone, though they were still pumping out the storm drain into another drain further up the road. Umm. Belfast has been roasting all week. High temperatures, sun burnt colleagues, paddling pool out in the back garden. With only a little bit of overnight rain, a paddling pool also formed under the railway bridge at Mays Meadow (back of the Waterfront Hall) this morning. By evening, the Roads Service still hadn’t blocked off the road or put up a warning flood sign. Leaves blocking the drains? Wrong time of year. But it looked a bit like the River Lagan was coming in land (again). 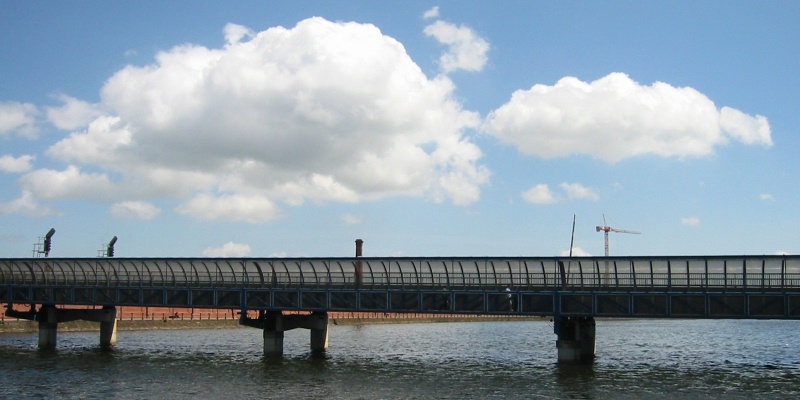 This section floods every couple of months – but the water doesn’t usually rise so high. Not too many postings this weekend. Exhausted and distracted by running an event on Friday and Saturday night, my mind and fingers have been elsewhere. 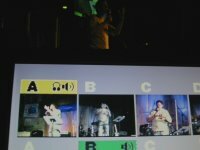 I'm beginning to wonder if live vision mixing/directing on a TV channel is any worse than my annual headache? Four cameras - one fixed to the wall, two fixed on tripods but pan and zoom, the fourth mobile. The worst handicap is the lack of talkback to any of the camera guys. So throughout the two hours, I regularly end up with two or three identical shots of the same guitarist strumming. Oh, and the guys who helped out on Friday night weren't available on Saturday. No major disasters - other than one camera having no tape inside so it powered off every 4 minutes! And the DVD recorder even managed to capture both the audio and video - something we didn't have time to test before hand. On a positive note, thank goodness for Apple Macs. Robust, no, make that bullet-proof. What PC would smoothly and simultaneously run multiple Powerpoint presentations, along with a variety of MP3 music and video files? The Sunday Times included a brief comment on Thursday night’s openings at the Ormeau Baths Gallery – both inside and outside the building. The controversial Ormeau Baths Gallery, re-opened in Belfast last week with rival exhibitions both inside and outside the building. The gallery, which was closed in February after losing its arts council funding, is now under new management. On Thursday it re-opened with an exhibition of contemporary art, while supporters of the previous management staged an “Ormeau Baths Gallery in Exile” exhibition in a van parked outside the gallery and an exuberant launch party on the steps of the building. Alan McBride wrote a belated thank you to the patient staff of the (old) Ormeau Baths Gallery. And Jett Loe covered the reopening in a huge posting on his Letter to America blog, with mention promised on this week’s LTA podcast (due out on Monday night). Hurrah! It rained last night. Am I the only one to have heard rain beating down against the roof and windows last night, and found themselves delighted that the world might be a cooler place this morning? It's too hot in Belfast! I feel old tonight. The first of two nights of a big youth event over, my head is throbbing with the loud music, hurting with the concentration of mixing the video feeds for 2 and a bit hours, and wondering if the 600+ kids and leaders are enjoying the programme and engaging with it. Pleased that the voxpops we filmed at Easter in Belfast fitted in with the theme, and most of the technology ran smoothly and without distraction. 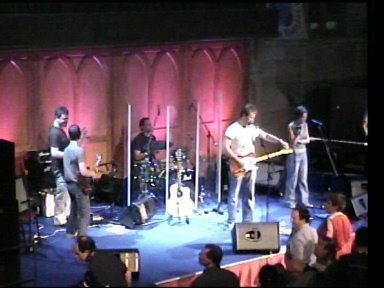 Now to do get some sleep before we do it all over again tomorrow night for the second audience. Finola Jones had been planning to put on her show The forward lengthening of the past at the Ormeau Baths Gallery – but then it closed. So on Thursday night, between 6pm and 9pm, Finola presented the European première of Hotel Moscow in a venue (well, a van) outside the Ormeau Baths Gallery. A press release was issued about this special OBG-in-Exile show. I’m not sure if it was an elaborate spoof or the real thing. If you were there, please post a comment and describe the occasion. As part of the shake-up of the House of Lords, a Speaker is being elected for the first time, filling a role previously filled by the Lord Chancellor. The winner gets a big office, two secretaries, £100k salary, £34k housing allowance, as well a black and gold robe to wear on formal occasions. The Lords’ Speaker is likely to be invited to all state occasions, alongside the Commons’ Speaker. 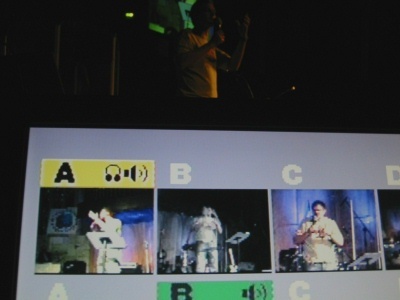 Nine candidates have entered the contest – three men, six women. Unlike all other political contests. it would apparently be undignified for individuals to campaign openly for the post. So, in a move consistent with the stereotyped image of the eccentric upper house, the candidates were allowed to write a 75 word statement to make their pitch. Two of the contenders are openly proposing to keep the status quo and not use their position to interfere with the proceedings at the Lords. Lord Redesdale, 38, Liberal Democrat. A bit like our local MLAs, who are taking a lot of money to fulfil a mostly ceremonial role by not doing much work up at Stormont. I found myself sitting opposite Lord Alderdice – the first Speaker of the NI Assembly – on the Heathrow Express at lunchtime. It didn’t occur to me to ask him if he would have liked to have joined the case to be Speaker in the Lords. Next time.